In industrial areas, heavy shipping or luggage carrying sectors, taking weighted luggage or packages from one place to another becomes beyond impossible for a human. So, luggage carts are designed to ease your work. 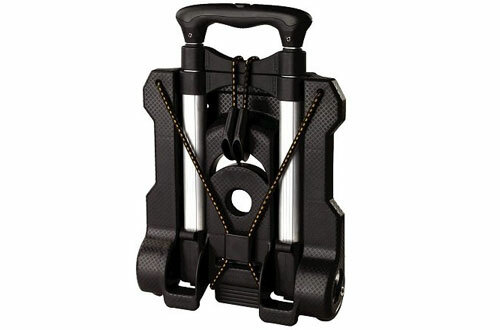 Coming with bungee cords or tie-ropes, it will keep your essentials secured in one position and prevent sudden falls. Further, the trucks are made resistant against wears, rusts etc. However, the weight limit varies with each product and the user can select the one that qualifies your requirements. Even the frame of these trucks is made sturdy to withstand even the heaviest weights. 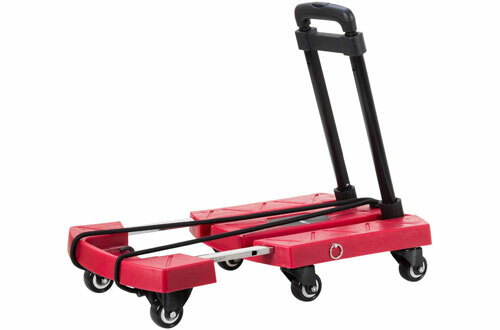 Thus, the luggage carts review will guide you the correct way so that you do not get derailed in this buying process. Give it a thorough read to know the best. Looking to meet all your moving needs? 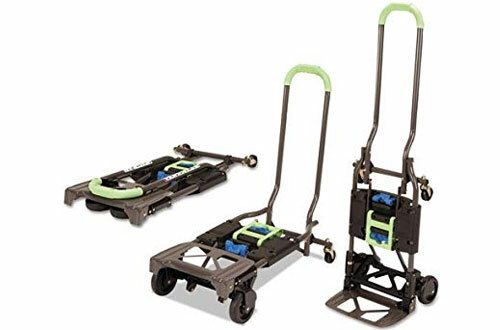 Well, this folding hand truck by Magna Cart is truly notable! Ideal for office, travel and recreational purposes, this truck is compact with a capacity of 150lbs and has aluminium base of 15-inches with rubber wheels of 5-inches respectively that are foldable as well. For testing it’s resistant, it has undergone the toughest test. Plus, it is specifically known for its telescoping handle with an extension of 39-inches and folds flatly at 2.5-inches. In fact, its capacity to minimise to flat into the back of your car to its sturdiness and durability, this is a favourite of most users. 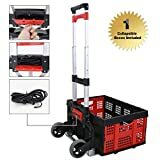 So, whether you slide it under the table or hang it from a hook, this foldable luggage cart will never let you down. Notable features are strong rubber wheels, constructed of aluminium, has a wide base, known for its locking positions of 35 as well as 39-inches. Especially known for its flat free tires. Comes in a ready-to-use format with no assembling of parts required. 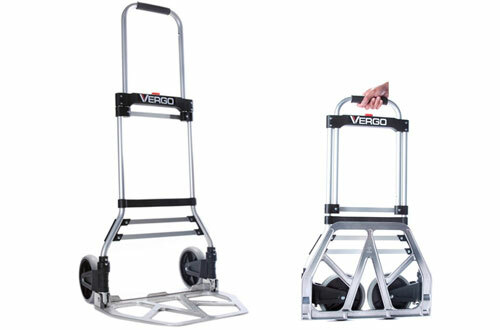 For transporting daily items, the Vergo hand truck is the one to check out. Suitable specifically for trade fairs, campgrounds and picnics, this feature handles of telescoping nature, has a capacity of 275lb and comes with a foldable nose plate. 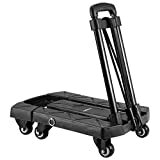 Comes with solid rubber luggage cart wheels of 7-inches base. 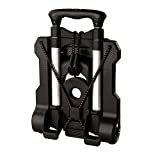 Easy to store since it completely folds down requiring 2.5-inches space. Coming from the house of Harper Trucks, this lightweight luggage cart with a 400lb capacity and solid rubber wheels is a true convertible truck to its name. This cart is enabled with telescoping handles up to 3 positioning and the built-in frame helps in gliding this cart with utmost ease. Comes with a plastic frame that is known for its I-Beam nylon filling. Weighs only 19.5 pounds and offers easy manoeuvrability. Are you a frequent traveller looking to increase your luggage capacity? Well, this folding cart from Samsonite is a great option to check out. Known for its adjustable strap anchors and easy manoeuvring courtesy to its rugged wheels, this folding cart helps to transport baggage with utmost safety. Made from the ballistic fibre of 1680 level and is wrapped in bale handles, it features a front pocket that can be easily reached during an emergency. And the shoulder strap is also removable. 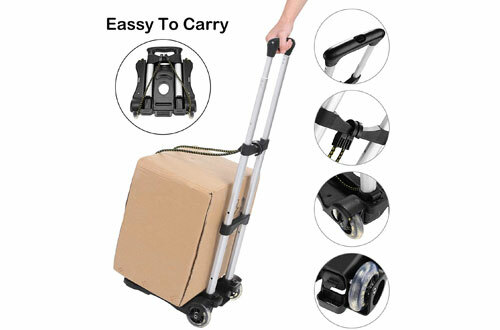 Furthermore, this cart also acts as the perfect carry-on and its absorbent stainless-steel base works for heavy luggage. Given that this is the perfect size to carry on; this cart has room enough for multiple cases. Flat area base measured at 10 5/8-inches with a capacity of 70 lbs. The oversized wheels can swing naturally, and the platform can be changed accordingly. Manufactured from ROYI, this folding luggage cart hand truck is compact in terms of weight and therefore can be folded easily. With flat bungee cord and handles of telescoping nature, it is constructed of thickened steel. Thus, it endures heavy-duty usage plus maintains stability. 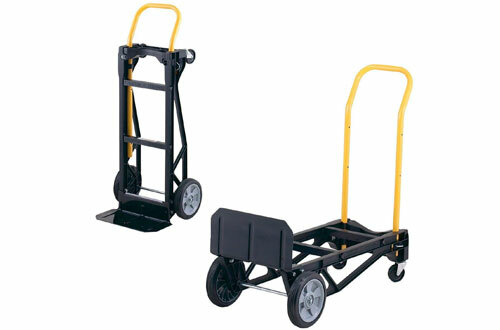 Moreover, this hand truck is notable for its durability and tank wheels of the highest quality as well as standard. So, it will not wear out easily and also creates less noise. In fact, the handle can be shrunk and extended as per choice with durable and water-resistant rubber wheels. Also, it is equipped with a specified All Wheel Drive System which thereby enhances the acceleration process. Lastly, the rods made of high-end resin giving it the concerned durability and the base plate built of thick PP plastic is also large. Drawbar has a capacity of 155lbs and made of thick steel material. Weighing 4.5 pounds this telescopic handle ranges from a range of 13-inches to 19-inches at the base level. Suitable for long-distance travel and is wear-resistant, noiseless and folded up easily. Includes a flat bungee cord for efficient packing. A notable heavy-duty hand truck suitable for moving boxes and heavy lifting, this product from Cosco is a winner in every term. Firstly, this shifter works in both ways and converts into a 2-wheel hand truck as well as 4-wheel hand truck minus the pins and plugs. Further, store it in your closet or car as it folds flat, this folding truck works in both ways. Having a multi-position design, this heavy-duty truck has a steel frame which holds up to 300lbs and weighs up to only 14.92 pounds. Also, its flat-free tires have a specified 5-year warranty period and work in the vertical-horizontal format! Warranty of a good 5 years. Easy to install and works in tool-free transformation format. Has an innovative flat-fold design known for its versatility. Built of the aluminium base, this is known for its rolling wheels and aluminium nose plate of die-cast aluminium. Holding up to 133lbs, this cart is notable for its rust and wear-resistant wheels with a corrosion-free format. The luggage cart handle is notable indeed for its telescoping feature and ranges within 35 to 39-inches, with user heights and minus additional installation. Moreover, its grip handle is ergonomic in nature and apart from the heavy box; the collapsible box is suitable for holding small items. The lock-release bar makes it extremely safe when transportation is for a long-space. As a matter of fact, the basic material is a combo of aluminium, plastic and steel whereas the wheels are made of PVC. The rugged handle and middle bar combo give it the much-required stability. Its large wheels ensure easy gliding through the floors minus a scratch. 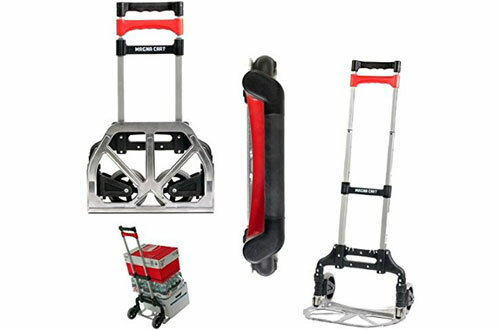 Have you been looking for a premium portable hand truck for easy transport? 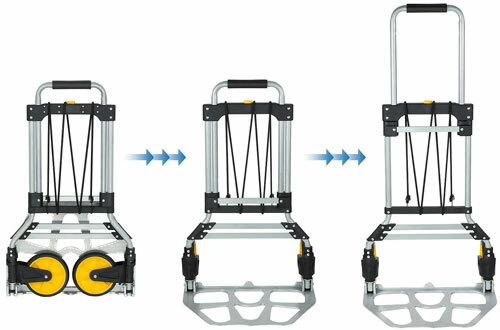 The Mount-It hand truck is the one that will provide you with these positives with no assembling tensions, minimal storage and easy to fold format. Having a capacity of 264lbs, this is built of the alloy of aluminium and has rubber wheels that make gliding an easy job. With extended handles and nose-plate for folding, this includes a bungee cord to secure its luggage at all times. 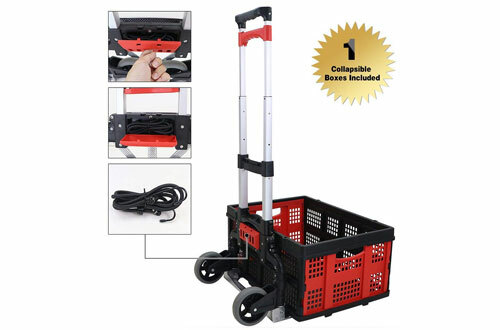 The adjustable height with dual settings ranging up to 42-inches, this compact cart is scratchproof and durable thus making it a perfect choice. Finally, it will just unfold in a matter of a few seconds. Made from a combo of steel, rubber and aluminium. Extended telescopic handle with a rubber grip as well as soft foam to ensure complete strength. Wheels made of rubber that adds to the traction level. Coocheer brings a portable aluminium luggage cart that has a unibody design and can carry a weight of 3.5lbs. The wear-resistant wheels and its plastic and metal combo body make it one of the picks for travelling or shopping. With a carrying capacity of 80 lbs, the ropes help to keep your essentials intact in a place. Plus, the ropes are adjustable. The adjusting dual gears and notable folding design makes it easy to use with just a nose plate for company. Besides the wheels are wear-proof and will generate minimal noise while you are out shopping or travelling. Have 2 strong extra files to ensure easy assembly. For its unmatched performance, it deserved this spot. 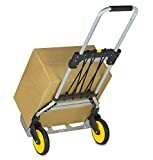 Whether to carry food or deliver cargoes, be it heavy or light, this folding hand truck works well in all conditions. 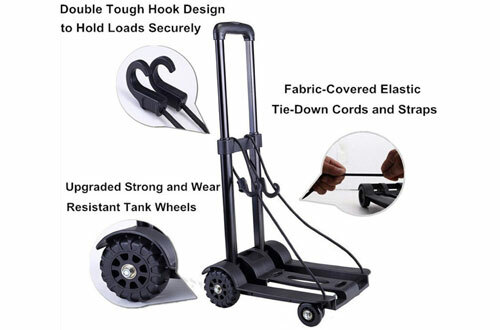 With an extendable handle and easy to fold format, this hand truck can hold up to 440lbs of cargo and comes with tie-downs to ensure that the goods do not move from their place. With a loadable surface of 5-inches and bungee cord for the company, it’s adjustable backwards and forward handles ease swift turns. Moreover, its PP plastic material ensures complete safety of the products. Telescopic rod ranges from 15-inches to 25-inches to 35-inches, as per user requirement. 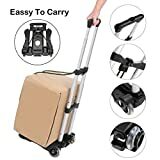 It’s better to carry your luggage or packages on heavy-duty folding luggage carts in order to save yourself from severe struggles.